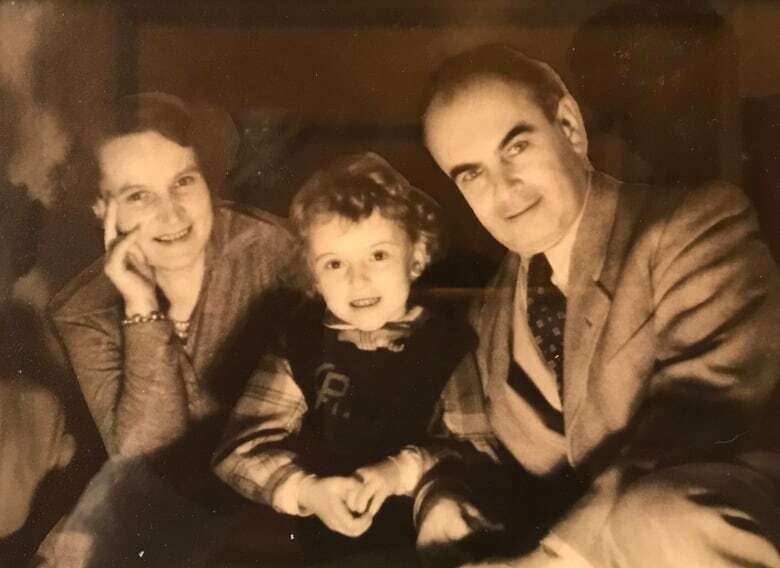 During the Second World War, a Jewish refugee escaped the Nazis and fled to Shanghai. 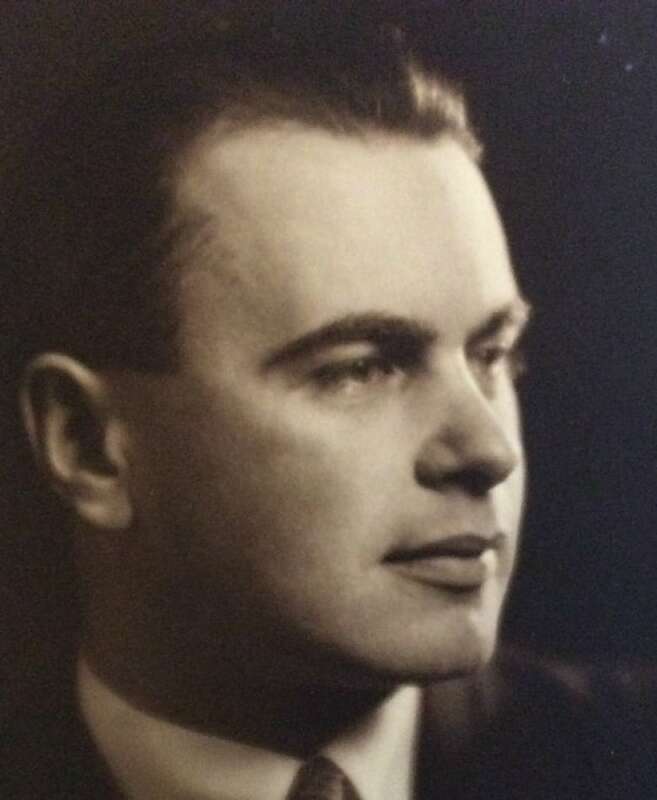 There, he taught music to a group of orphans, but abruptly disappeared in 1947. The Chinese-Canadian son of one of those orphans, Fang Sheng, set out to solve the mystery of what happened to him. The name Adler has been in the back of Fang Sheng's mind since he was a child. It was the name of a Jewish refugee who fled to Shanghai to escape the Nazis. He was a musician who had a lasting influence on Fang's family, and China's musical culture. But his story has a touch of mystery. 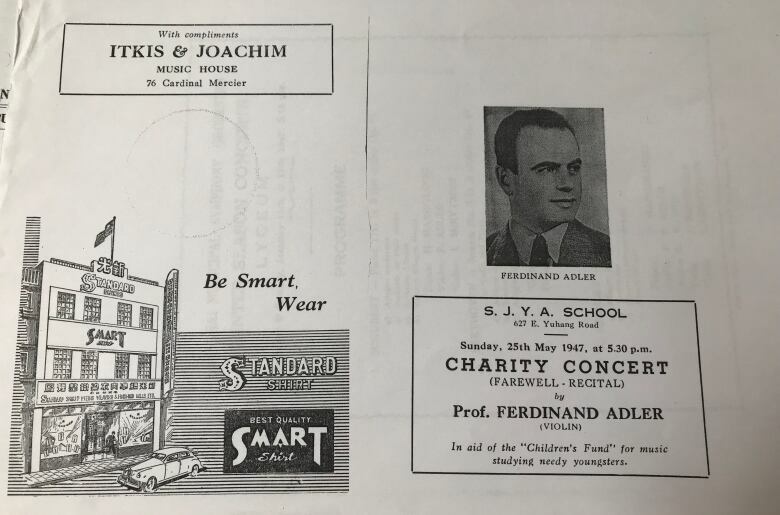 "At first I couldn't even find Adler's first name, it was only after a long and deep research did I find out that his first name was Ferdinand," Fang told CBC's Sharon Wu, in her documentary Finding Adler. Fang's father and uncle lost both parents soon after Japan invaded China in 1937. They grew up in an orphanage in Changzhou, 200 kilometres northeast of Shanghai. One day in 1946, a group of Jewish refugees showed up to teach them music. 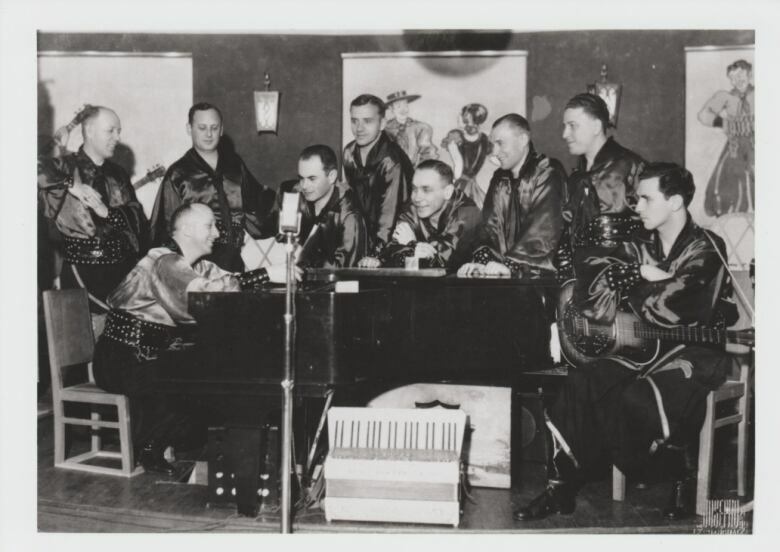 These musicians were among 20,000 "Shanghai Jews" from Europe, drawn there as it was one of the only places that didn't require a landing visa. One of them was Ferdinand Adler, a violinist from Vienna. Fang's father, Ming Liang Sheng, was 12 years old at the time. He was placed in Adler's class with 10 other Chinese orphans. Fang's uncle was put in another class with a Jewish cellist. The siblings were part of the generation who later became the backbone of China's classical music scene. "My father, mother and brother are all professional musicians," said Fang, who moved to Canada more than 20 years ago. He lives in Toronto where he works as an interpreter. Ming Liang still lives in Beijing, and turns 86 this year. "We were just a bunch of poor kids, he was the concertmaster for the Shanghai Municipal Orchestra," Ming Liang said. 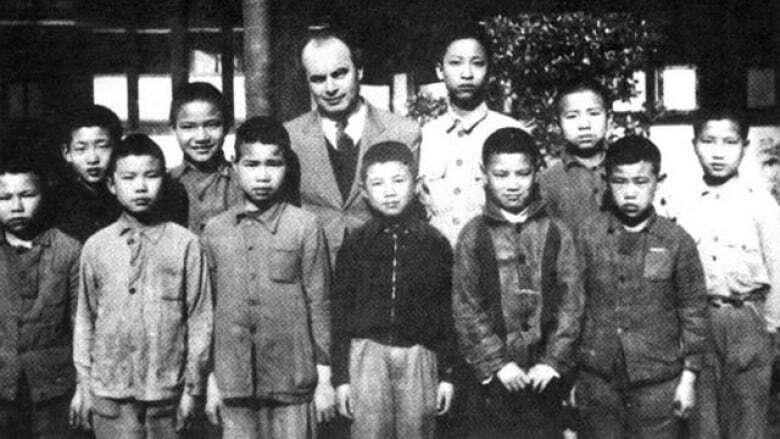 Every weekend in 1946 and 1947, Adler would get on a train travelling from Shanghai to Changzhou to teach at a makeshift music school set up inside a temple. 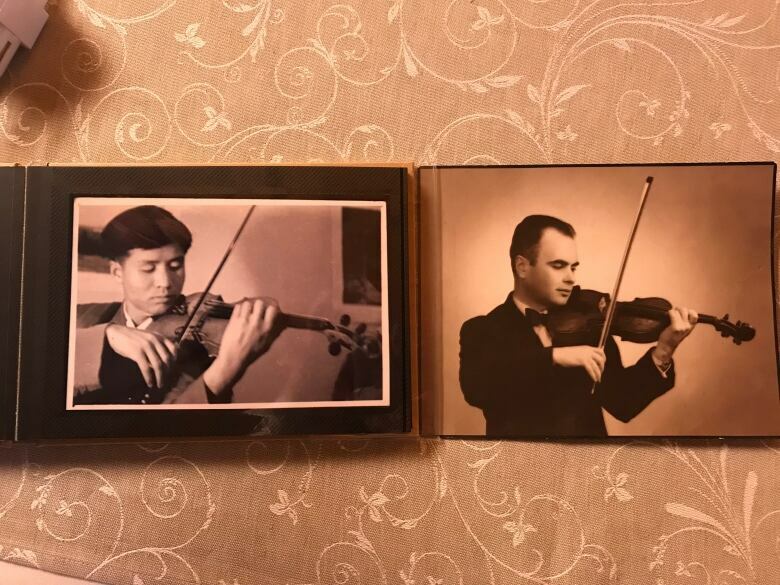 "I felt there was no language barrier at all," Ming Liang remembers of his first violin lessons 70 years ago. "He used his hand to show me how to position each of my fingers on the strings. It seemed this was a natural way to teach and learn violin." After the Sino-Japanese war ended in 1945, civil war broke out and tension escalated quickly. In 1947, Adler abruptly left China. "I have so many questions [about him]," said Fang. "How did he flee Europe? What was his life and career like before he had become a refugee? After 1947 he left China — what happened to him?" In February 2017, Fang created a Facebook page, called The Adler Project, to try to answer some of those questions. He posted the only photo of Adler he owns: an old black-and-white picture of the teacher and his class, taken right after their last lesson. Fang hoped he could find people connected to the Shanghai Jews community, or at least find some pointers as to Adler's whereabouts. But the page didn't lead to any clues. In August that year, however, Fang saw a headline that made him jump off his chair. 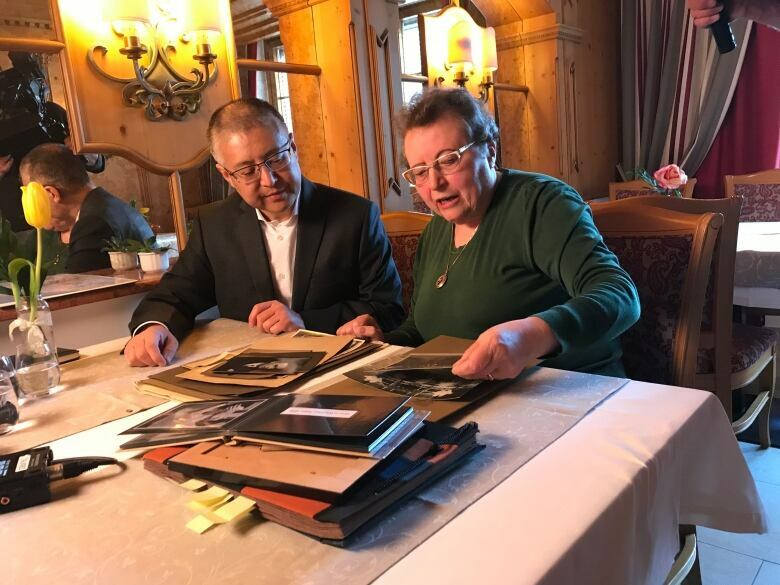 An Austrian woman had met with the Shanghai Symphony Orchestra, to tell them about her father's past with the Orchestra. His name was Ferdinand Adler. The online article included a photo of Christina Adler, holding two pictures of her father playing violin. "I was very surprised but very, very excited, I thought that my search is seeing the light of dawn," Fang said. Immediately he reached out to the orchestra for Christina's contact information, but he received no response. Then months later "the most amazing moment" arrived. It was a simple "Like" on the Facebook page from a man named Paul Rosdy. "I noticed that he went to Vancouver Film School. At first I thought he was Canadian," Fang remembers. He got in touch with Rosdy to see if he had any information. It gave him the breakthrough he needed. Rosdy, a filmmaker in Vienna, had made a documentary about the Shanghai Jews twenty years ago: The Port of Last Resort. He had come across Adler's story, and found his daughter Christina. Rosdy was able to give Fang her contact information, and the lead he needed to answer all of his questions. Kufstein, a picturesque town in western Austria, has been home for Christina Adler since she was seven. On March 25, Fang travelled there to meet her. Sitting side-by-side, the pair compared their fathers' collections, bringing seven decades' worth of memories to life through hundreds of pages of photographs, concert brochures, clippings and letters. Simone Telser, a family friend, acted as translator for Christina. "You are the best proof of this — because before that she hasn't heard about her father teaching orphans at any point," she told Fang. Christina helped Fang pull together the missing pieces of Adler's life story, and why he had so abruptly disappeared. Christina was born in Shanghai in 1945. But as Civil War in China escalated, her parents decided to return home to Vienna. "I was only two years old," Christina said. "I myself cannot remember Shanghai at all, but my mother always said that the time in Shanghai had been the best time of her life." Life in post-war Vienna was difficult, especially for artists. Bouncing between auditions, rehearsals and concerts in order to make ends meet for the family, Adler was clearly burning out. After a heart attack at a concert rehearsal in 1952, he died. Christina was only six. The next year, Christina and her mother Gertrude moved from Vienna to Kufstein, to live with Christina's aunt and her family. She's lived there ever since. Fang brought a little surprise for Christina. Unzipping a small case, he reveals a violin. His father bought the instrument in the 1950s. It was the very first violin Fang played, in his first music lesson when he was seven. "I've been practising a little piece before this trip and hope to play for you now," said Fang, who hasn't performed since he was 15. He played Love's Sorrow, by one of the most famous classical violinists of his time, the Jewish Austrian Fritz Kreisler. "I'm so touched, after more than 70 years people are still caring and sharing the memory of my father," Christina said. Fang feels lucky to have rediscovered a missing part of his family's history, and find the person who made music such a part of their lives. "I think music is in there throughout," he said. "It represents what we are working hard towards, it represents what we believe in." Listen to the documentary near the top of this page. Finding Adler was produced by the CBC's Sharon Wu and The Current's Liz Hoath.